It was a fun final few days for Jean-Luc Van Den Heede, the seasoned Frenchman who this morning claimed victory in the Golden Globe Race 2018. 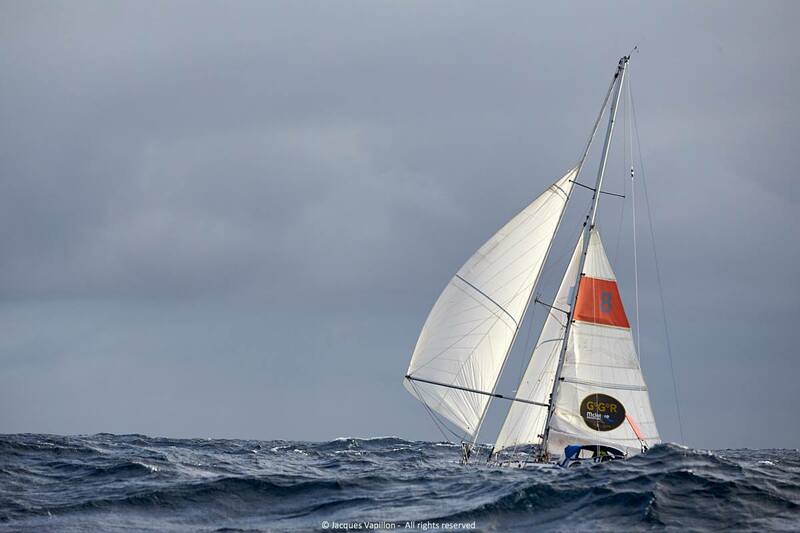 After some brutal conditions in the North Atlantic the wind finally swung into the northwest allowing him a downwind slide into the finish where he crossed the line off Les Sables-d’Olonne on the west coast of France with a full main and spinnaker flying. He completed his lap of the planet in this retro race in a time of 212 days, a full one 101 days faster than the reference time set 50 years ago by Sir Robin Knox Johnston. It was by any measure an extraordinary performance by an extraordinary man and let us not forget that he is 74 years old. The Golden Globe Race celebrates the 50th anniversary of the original solo, non-stop around-the-world-race and the 18 original entrants were compelled to climb into a time machine and race around the world as if it was 1969. No electronics, no auto pilots, no satellite comms, you get the picture. Of the 18 starters only five, not counting Van den Heede, are still out there grinding their way toward the finish. To give you some perspective on how long it has been since Jean-Luc last touched dry land, how many remember what you did to celebrate July 4th (in the US)? Jean-Luc and the rest had already been at sea for three days by then. Yes it’s a long and slow slog in a small boat all alone and that must make his arrival in France that much sweeter. 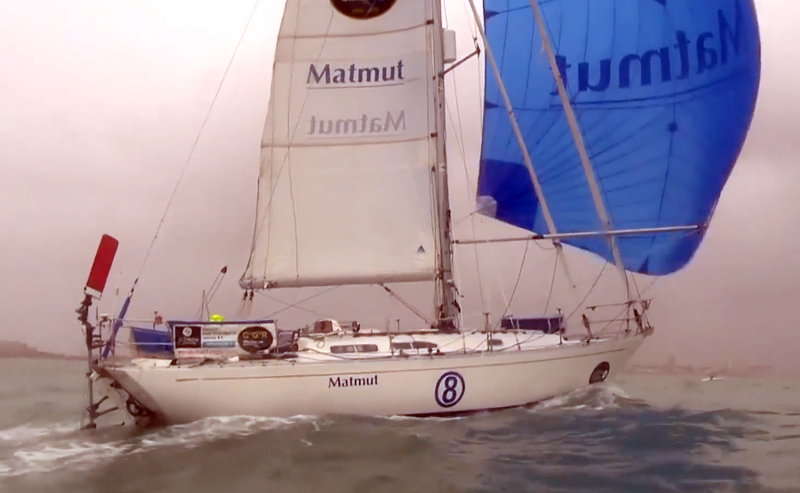 The fact that his Rustler 36 named Matmut had carried him 30,000 miles with hardly any issues speaks volumes about Van Den Heede’s seamanship. When Jean-Luc sailed into Les Sables-d’Olonne this morning there was a huge crowd on hand to cheer him in. The breeze was blowing directly up the channel that leads to the inner harbor so he kept his bright blue spinnaker up for most of the way while the breakwall was lined with cheering fans. The French love this kind of thing and Van Den Heede is the local son of Les Sables-d’Olonne. On the way up the channel he would have passed his apartment that looks out to sea. This was his sixth single-handed circumnavigation. He previously did the 1986 BOC Challenge and in 1990 and 1993 he did the Vendée Globe where he finished on the podium both times. In 1995 he did another BOC Challenge which is where I met him, but his singular most admired accomplishment (prior to winning the Golden Globe) was a solo, non-stop lap of the planet against the prevailing winds. In 2004 he completed the voyage in a record time of 122 days and 14 hours. In a previous life Van Den Heede was a math teacher but he found his calling as a professional sailor. He is a kind, good hearted and very generous man who always has time for you. He speaks of his love of the ocean and the beauty he finds out there with almost poetic reverence. 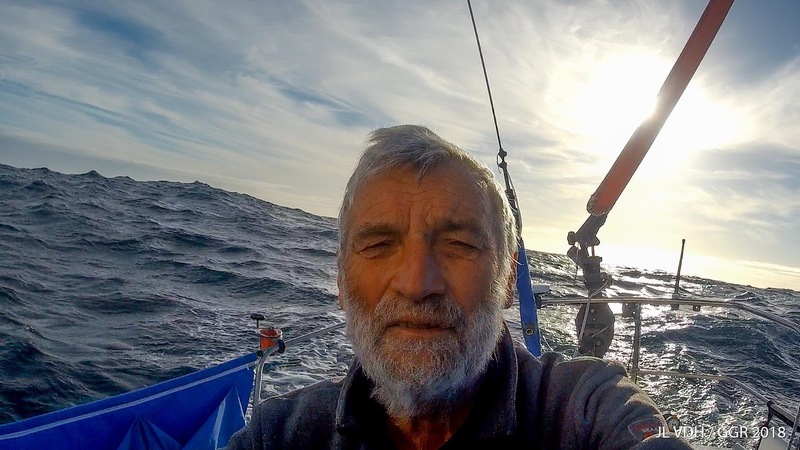 For Jean-Luc, as it is for many other professional sailors, it’s almost a religious experience to be alone on the water for an extended period of time with just the wind to blow you around the world. While Jean-Luc was most definitely an early favorite to win the Golden Globe it was not an easy victory. In the Southern Ocean he was rolled and his mast badly damaged. He talked for a couple of days about stopping to fix things, but instead decided to shore it up somehow and keep on racing. For the next 15,000 miles the damaged rig was a constant worry especially when second place Mark Slats cut his lead from over 1,000 miles to at one point less than 50 miles. Slats was pushing hard knowing that Van Den Heede was compromised, but it was not enough and Jean-Luc now adds one more victory to his already impressive resume. Félicitations my friend. You have the respect of the entire sailing world. Enjoy your success. There is a lot of video of his arrival and press conference at the GGR Facebook page. To visit the page, click here. 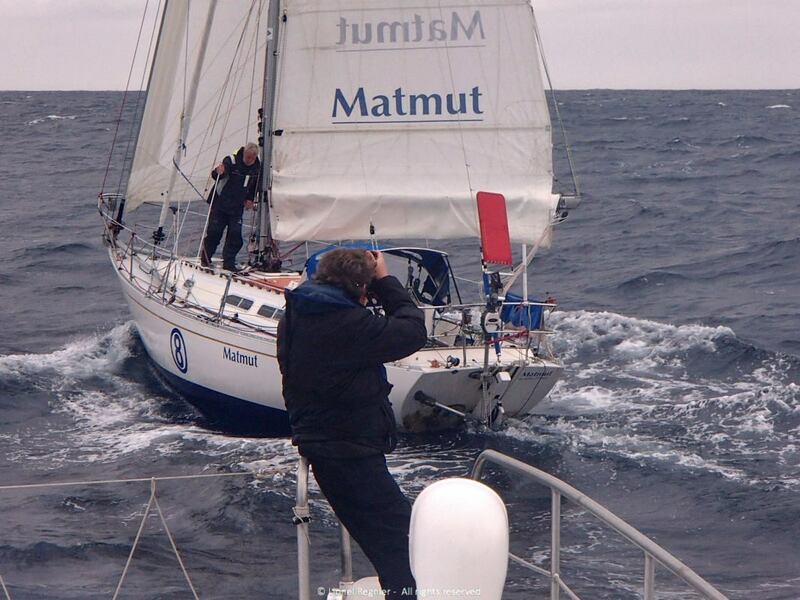 Congratulations to Jean – Luc and all the sailors who made the attempt! Absolutely amazing and he looks great; certainly give me encouragement to simply complete the ICW at age 79. Well done Jean Luc! You are an inspiration to us all! Fantastic achievement! Hell he is my age, and I’m afraid to leave the house in fair weather! His achievement is nothing short of incredible. I wish him many more successful voyages.